Some events are so rare they last only for moments. This was the case for the Langbord family in 2003 when they found $80 million in rare gold coins. One such coin fetched $7.5 million at a Sotheby’s auction in 2002. The family made the discovery after drilling into a safety deposit box that belonged to their deceased father, Israel Switt. Inside were 10 coins, each a 1933 Saint-Gaudens. They are among the rarest coins in history and the Langbord family didn’t hold them for long. The family took the coins to the Philadelphia mint for authentication. It was the last time they would hold the fortune in their hands. The government promptly seized each coin. “This is a case that raises many novel legal questions, including limits on the government's power to confiscate property,” remarked the family’s lawyer. 445,500 of these coins were minted in 1933, however, none were officially circulated. The mint received a mandate to melt them all down into gold bars when president Franklin D. Roosevelt ordered banks to abandoned the gold standard. Two coins were intentionally left untouched. Today they both reside in the U.S. National Numismatic Collection. Over the years authorities have learned of 20 coins that somehow escaped melting likely as a result of theft. In time the Secret Service found 19 of them and melted down all but nine. The gold content and rarity are what make this coin so valuable today. When the Langbords learned that their coins were gone they received no compensation. The reason: it’s believed that Switt had access to various stages of the minting process in the 1930s and was able to obtain the coins illegally. However, the Langbords have argued that it’s possible that the coins were, in fact, obtained legally during a very narrow “window of opportunity.” This argument rests on the fact that the mint first struck the double eagles on March 15th and it wasn’t until April 5th that Roosevelt enacted the executive ban on the coins. In 2011 a jury determined that the coins are in fact the legal property of the U.S. Government agreeing with the argument from the mint’s attorney who stated “these coins didn’t go out through the front door - they went out the back door.” The ruling resulted in the family filing an appeal, which was struck down by the Eastern District Court of Pennsylvania, citing that "the coins in question were not lawfully removed from the United States Mint." The family eventually appealed to the U.S. Supreme Court in April of 2017. However, the court denied to hear the case. It’s likely that the Langbord’s discovery will go down in history as the singles largest find of the ultra-rare double eagle coins. 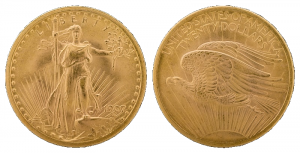 To this day the coins are legendary to collectors because they represent a pivotal moment in the U.S. economy when the nation moved away from gold and into dollars backed only by confidence. Even if they could turn back the clock to the day of their find it’s unlikely that the Langbords could have done much differently. Selling them would have been illegal resulting in a prison sentence. Keeping them secret wouldn’t offer any financial value. For a few days they were among the richest elite, until they weren’t.